In short, crime fiction is a game where you’ve got to play fair. Which is why his “Philo Vance” series continues to please: all the clues are visible to you as well as to Vance, and there’s a pretty good chance—if you don’t get distracted—that you’ll figure out who-done-it before the culprit is nabbed. Test you wits for days with this criminally entertaining collection. 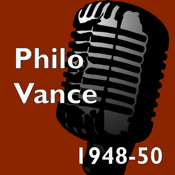 About the series: The Philo Vance of film and radio wasn’t quite the same character as the one found in S. S. Van Dine’s stories. This was actually a good thing. The man introduced in “The Benson Murder Case” was an irritating dilettante, prone to Latin quotations and impromptu dissertations on Chinese ceramics, Egyptology, classical music, and Renaissance art. Plus an expert polo player, dog breeder, archer, and golfer. When Philo Vance was eventually picked up for film, producers kept the clever Van Dine plots but retooled the lead’s personality. To get a sense of the improvement, he was first played by William Powell in what wound up as a warm-up for his Nick Charles “Thin Man” persona.